and a choice of dining venues. An Arizona legend, the JW Marriott Scottsdale Camelback Inn Resort & Spa occupies 125 acres at the foot of Scottsdale’s Camelback Mountain, as it has since 1936. Today’s guests experience a hotel that celebrates its storied past yet infuses every stay with a thoroughly modern spirit of adventure. For meetings, the Arizona Ballroom divides into 14 sections to hold 20 to 2,000 participants. An additional 5,000-square-foot, enclosed foyer accommodates large receptions and exhibits, while the new Paradise Ballroom, opening in June 2018, offers 15,000 square feet of flexible space, floor-to-ceiling windows, and eight breakout rooms. The entire facility has sky-high ceilings and state-of-the-art technology, including keyless entry and security, wireless and high-speed connectivity, production lighting and sound capabilities, and electronic reader boards. For after-hours socializing, a serene courtyard outside the main lodge comes with water features, fire pits, and views of Camelback Mountain. The restaurants feature outdoor seating among gardens and fireplaces. The center of the action is found at the Lobby Bar, which is ideal for guests who wish to congregate in either large or cozy groups. 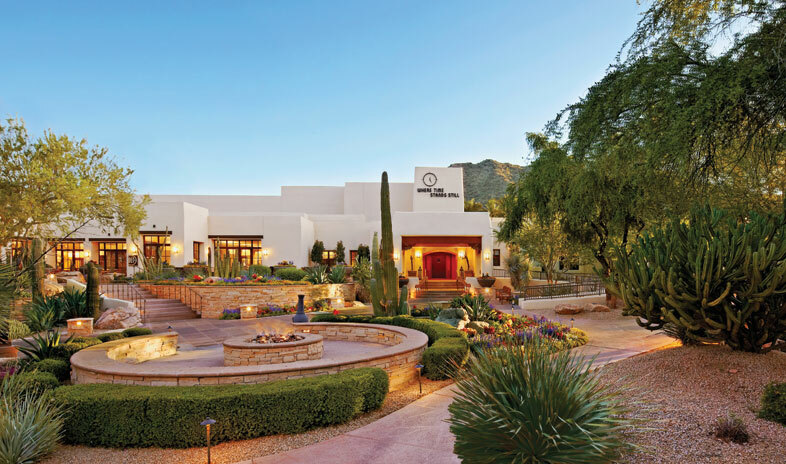 The resort’s authentic Southwest experience also encompasses 36 holes of championship golf, the signature Spa at Camelback Inn, and casitas with traditional décor spread throughout the property. Also popular are tours of nearby natural wonders and visits to Scottsdale and downtown Phoenix. Staff was very friendly and knowledgeable. Food was very good. Rooms were not outstanding but good. Picture-perfect, beautiful resort with breathtaking mountain views. The hotel staff was more than accommodating for our group and the food was excellent. True Scottsdale feeling when you stay here. Everything about this resort screams SouthWest. Scenery is amazing. Casita style resort. Newly renovated outdoor space is so peaceful. Wasn't crazy about the meeting space, but loved everything else about this resort. About as perfect as it could be. This is one of my favorite resorts in the world. Not only are the grounds immaculate, but you truly feel like you're at a Southwestern desert oasis. I'm local and I love doing staycations here as well as going to the spa. The events I've held here were wonderful (food was superb, conference services & staff were great & my group thoroughly enjoyed each moment we were there). I would have no hesitation about returning to the Camelback Inn. I love this resort and have had 2 consecutive yearly Summits at The Camelback Inn - I even vacation here and send my parents here for their yearly trip to AZ to celebrate their anniversary. The grounds are spectacular, the food is wonderful and the staff is tremendous. You won't be disappointed! In all the world...only one! What else can be said. Camelback is one of the finest in Scottsdale. Elegant, service quality that is unsurpassed and all that you may need from golf to spa to meeting facilities. We'll bring more groups back to Camelback. Loved this property. There are pluses and minuses to a corporate flag and this property had all the pluses. Extremely efficient and careful back-of-the house and conference services. Terrific facilities, plenty of service staff. Greal locales for outdoor events, and meetings. Close to the airport and easy to get to. Terrific spa - huge! Pool is very dramatic as it is built to float above the resort so you don't see the casitas. It's as if you are in the surrounding mountains. Scottsdale downtown a fun place for after-dinner recreation, shopping, etc. I have had several meetings at this resort because they have great meeting space and they are very accommodating. Good Location.